Territory: Half of Emilia Romagna territory is formed by the Apennines; the other half is a large plain, which reaches to the Adriatic Sea. The coastline is flat and sandy, with a typical lagoon and marshy area (the Valli of Comacchio). 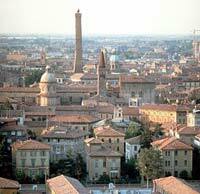 Cities: The regional capital is Bologna. Other important cities are Parma, Ferrara, Modena, Piacenza, Ravenna, Forlì, Reggio Emilia. Art: Important Roman traces can be found in Rimini and in Ravenna, capital of the Western Roman Empire in the fifth and sixth centuries A.D., with its magnificent monuments of the Christian-Byzantine period (the exquisite mosaics). Examples of the Romanesque Longobard style can be found in the Cathedrals of Modena, Piacenza e Ferrara; the Baptistery of Parma offers the visitors some important sculptural works. Piacenza and Bologna have valuable examples of Gothic style, but also of the Renaissance and Baroque styles. Museums: In Bologna: the Pinacoteca Nazionale, with three sections devoted to painting, from the fourteenth to the eighteenth century; the Museum of Industrial Art, which exhibits furniture, objects and sacred relics, from the sixteenth to the eighteenth century; the Civic Archaeologic Museum, which houses very interesting prehistoric and Etruscan relics. Ferrara has the Cathedral’s Museum, which holds sacred relics, paintings and sculptures; the Civic Museum, which displays bronze, ceramics and frescoes; the National Archaeologic Museum, that houses precious ceramics (Attic vases with red figures); the Pinacoteca Nazionale with pictorial works from the fourteenth century to the present day. Ravenna, ancient link between the Roman and the Byzantine worlds, has the National Museum with many relics of the Roman and Early Christian Age; the Archiepiscopal Museum with an interesting collection of works from the Ancient Cathedral. In Modena there are the famous Estense Gallery, where marvelous paintings can be admired; the Estense Museum, the Museum of Risorgimento and the Estense Epigraphic Museum. To be visited: In Ravenna: the splendid Mausoleum of Galla Placidia, erected in the fifth century A.D. and the tomb of the great poet Dante; the Mausoleum of Theodoric and the magnificent basilica of Sant’Apollinare in Classe.